Sales Forecasting is the process of estimating what your business’s sales are going to be in the future. A sales forecast period can be monthly, quarterly, half-annually, or annually. 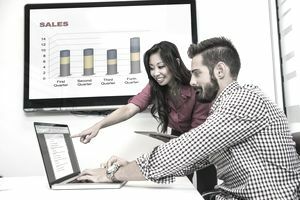 Why Are Sales Forecasts Important? Sale forecasting is an integral part of business management. Without a solid idea of what your future sales are going to be, you can’t manage your inventory or your cash flow or plan for growth. The purpose of sales forecasting is to provide information that you can use to make intelligent business decisions. For example, if your forecast indicates a 30% increase in sales of products or services you may wish to begin searching for larger business premises and/or hire additional staff to meet the demand. Conversely, a forecast of shortfalls in sales can allow you to mitigate the effect by taking advance measures such as reducing expenses or reorienting your marketing efforts. A sales forecast is an estimate of the quantity of goods and services you can realistically sell over the forecast period, the cost of the goods and services, and the estimated profit. Another list is made for the estimated cost of each good or service and a total cost (cost * #units). Subtracting total cost from the total sales gives an estimated profit for the forecast period. If your business has a huge number of items in inventory it may be necessary to condense unit sales/costs into categories. The economy and your particular industry - Is the economy slowing? Is the market for your goods and services growing or declining? Is there more competition entering the marketplace? Are you likely to gain or lose any major customers? Your sales forecast should include an estimate of percentage growth or shrinkage in the market. Regulatory changes - sometimes new laws or regulations can affect your sales prospects, either positively or negatively. Your products or services - Are you launching any new products or services that may increase sales, or are sales of your existing products/services declining due to better products/services or lower prices from competition? Will you be forced to raise prices due to increased material, labor, or other costs and how might this affect sales? Your marketing efforts - Are you embarking on any new marketing campaigns or spending more or less on advertising? Perhaps bringing a new company website online, beefing up your email marketing, or branching into social media to increase sales? Are you hiring additional sales staff or losing your best salesperson? Sales forecasting for an established business is easier than sales forecasting for a new business; the established business already has a sales forecast baseline of past sales. A business’s sales revenues from the same month in a previous year, combined with knowledge of general economic and industry trends, work well for predicting a business’s sales in a particular future month. If your business has repeat customers, you can check with them to see if their purchase levels are likely to continue in future. If you don't wish to contact them directly you can infer future activity based on the health of the customer industry. Sales forecasting for a new business is more problematical as there is no baseline of past sales. The process of preparing a sales forecast for a new business involves researching your target market, your trading area and your competition and analyzing your research to guesstimate your future sales. See Three Methods of Sales Forecasting and Sales Forecasting for Your Business Plan for further explanation. It is a good idea to create multiple sales forecasts using a range of predictions, particularly for new businesses. After creating an initial forecast using your best estimates create another forecast based on optimistic numbers and another based on pessimistic ones. Update your forecast with the actual values as time progresses. Sales forecasting done on a month by month basis will give you a much more realistic prediction of how your business will perform than one “lump” sales forecast for the year. You can also update your forecasts on an even more granular basis if needed, for example, you might want to do it on a weekly basis if you are concerned about hitting a monthly sales target. Business accounting software packages such as QuickBooks can perform sales forecasts, including individual forecasts, by customer, based on existing sales data. See 6 Advantages of Using Small Business Accounting Software, Before You Buy Accounting Software for Your Small Business, and The Best Accounting Software for Small Business. Also Known As: Sales forecast, sales predictions.